Lakhanda FM Radio Sri Lanka FM Live Streaming Online . Listen Over 50 Sri Lanka Internet Radio stations Online . Enjoy Live Stream of Lakhanda Radio . Press Play button to listen FM . 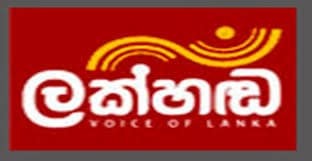 Lakhanda Voice of Sri Lanka , the radio channel inaugurated on 15 November 1996 , under the preview of SLBC . Eventually the channel was amalgamated to ITN on 1997 April 1 on a government cabinet decision . The programmes were transmitted on 88.5 F.M. 87.9 F.M. and 97.6 F.M. from transmitting points at Yatiyanthota, Karagahatenna, Bandarawela, Deniyaya and Colombo. Lakhanda broadcasts programmes for Sinhala speaking audience in Sri Lanka. Its island wide transmission opens daily at 04:30 hrs . and closes down at 00:15 hrs. local time. Lakhanda is the radio wing of the ITN the pioneer in Sri Lanka’s television . The programme contents are news and current affairs, politics, sports, education, cultural, health, women, economics and music . Programmes were commenced at 0500 a.m. in the first instance and then at 4:30 a.m. currently, until 12 midnight . From the tenth anniversary, which falls on 15 November 2006, it is proposed to transmit programmes for 24 hours. Address : LAKHANDA RADIO, P.O.BOX 2124, COLOMBO, SRI LANKA .